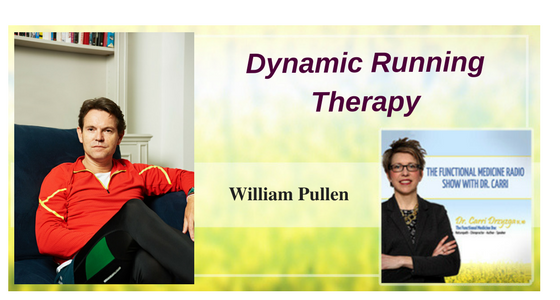 In this episode of The Functional Medicine Radio Show, Dr. Carri’s special guest William Pullen explains dynamic running therapy. William Pullen is a psychotherapist registered with the British Association for Counselling and Psychotherapy. He practices Integrative therapy and specializes in the treatment of depression, anxiety, problems of self-esteem and confidence, and substance abuse. How did you get into Dynamic Running Therapy? Is there research done comparing exercise to drug therapies? Can Dynamic Running Therapy be done with running or can it be applied to other forms of exercise? What “questions” are used in Dynamic Therapy? Dynamic Running Therapy is a fusion of elements of mindfulness, talk therapy, and running. It’s important to get moving and develop a good practice. Running gives a sense of competency and power. Movement must be seen as a medicinal enterprise, particularly for those with certain mental health conditions. There is more anxiety and depression among those who are not active. Mindfulness is a great way to address conditions like stress, high blood pressure, hypertension and anxiety. For thousands of years, humans have hunted, talked and moved together in small tribes for survival, mythology and relationships. Our DNA is primed for adventure but we have become very sedentary now. Dynamic Running Therapy is typically done while walking or running so they can focus on the questions for their condition and stay safe, compared to more dangerous activities like mountain climbing. Mindfulness is focusing the mind on self and typically on breath or you could focus on footsteps or counting trees while walking. To practice mindfulness, focus on your breath and count to ten and then start over. Mindfulness is a way of bringing yourself continually back into the living moment and away from all of your fears and concerns about the past and the future. The practice allows one to become present in the moment and away from the habit of a preoccupied or lazy mind and get out of the cycle of going back to the sore points of life. Mindfulness is about training the brain and making a choice to become somebody who can be in the moment and be present to what is around them. It can be argued that being overstimulated is a kind of trauma. Overstimulation keeps us in a state of constant arousal that is not productive. Our goal is to be in a fluid state where we can relax when we want to and bring our attention when it is needed by being in control of how we exist in the world. By constantly connecting to social media and other stimuli, our brain gets a kick with small incremental quick rewards. Since social media has quick rewards, other rewards that come from longer term activities like cooking, get replaced by quick rewards to make the brain lazy. The book gives questions for each run, which you can use if you want to while running or walking. The idea is that you learn to acknowledge what you really want. If you’re scared of what this question might bring up, acknowledge that and go when you’re ready to go. If you’re excited by it, acknowledge that, and take yourself on a journey of discovery as each question throws up new ideas and new memories and different ways of relating to who you are and the choices that you’ve made. Dynamic Therapy reminds you of the need to relate to yourself in a way that’s gentle and compassionate instead of that judgmental inner dialogue that doesn’t serve us. When we are not connected to our community then questions around personal status and purpose become even more important, which is known as status anxiety. To practice Dynamic Therapy, the practitioner familiarizes the reader with their particular anxiety by specific questions to understand the core issue rather than simply the fear and anxiety. Next step is to ask questions about the lifestyle choices, their work, relationships, substance abuse, community etc. The source of a lot of anxieties is the kind of relationship one has with oneself which can be destabilizing if there are layers of shame and fear. The core of the work is centered around one question: Must I fix or avoid every unpleasant feeling that I have or might I be better off just by acknowledging the appropriateness of some of those moments and just acknowledge it as appropriate. By developing a better relationship with your social anxiety, the symptoms will reduce and become of a manageable level and it works for majority of people. The book has chapter on how to mindfully run and mindfully walk, both of which are hugely rewarding and add to your sense of adventure,. The book has chapters dealing with all the mental health therapeutic conditions, questions on running with your kids to promote closeness. The book also has a program for running with your loved ones or people that you’re in close relationships with, to try and get close to them too. Dynamic Running Therapy book also shows a 4-step process on mindfulness that can be done by the readers by themselves or with others – start with sitting down for five to ten minutes before the run or walk. Step by step procedure – checking in with your body. You do a body scan. What’s happening from the top of my body to the bottom? What do I feel? Where are the pressure points? Where are the aches? I then ask myself, what are my senses picking up around me? We do a sort of sense scan. What can I smell? What can I see? What can I hear? etc. We then move on to, what am I feeling? I hasten to add for my clients, not “What was I feeling right before I got here?”, not “what am I feeling too much of?” What am I feeling right now? I want to get people to focus in the here and now because that’s where I want them to be. Fourth step is a question, “priming moment,” which is simply an opportunity to focus on what you want out of that session. If you do not know what you want out of the session, you go with a spirit of adventure to just explore. You may decide to move fast or slow. You may decide to seed yourself with a thought or question, or you may decide it’s just enough to travel thinking about your breath, thinking about your footfalls.